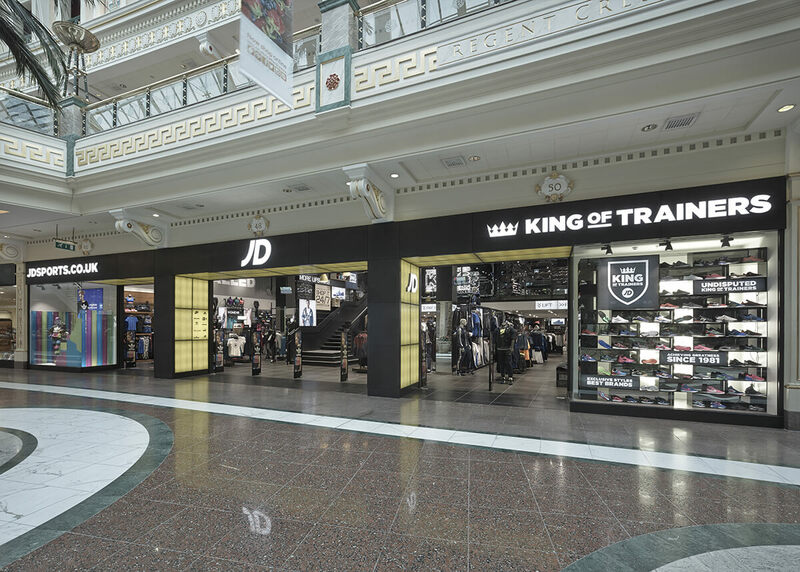 Sports-fashion giant JD Sports called upon RoC Consulting Special Projects team to deliver a new concept Flagship Store within the Trafford Centre, Manchester. 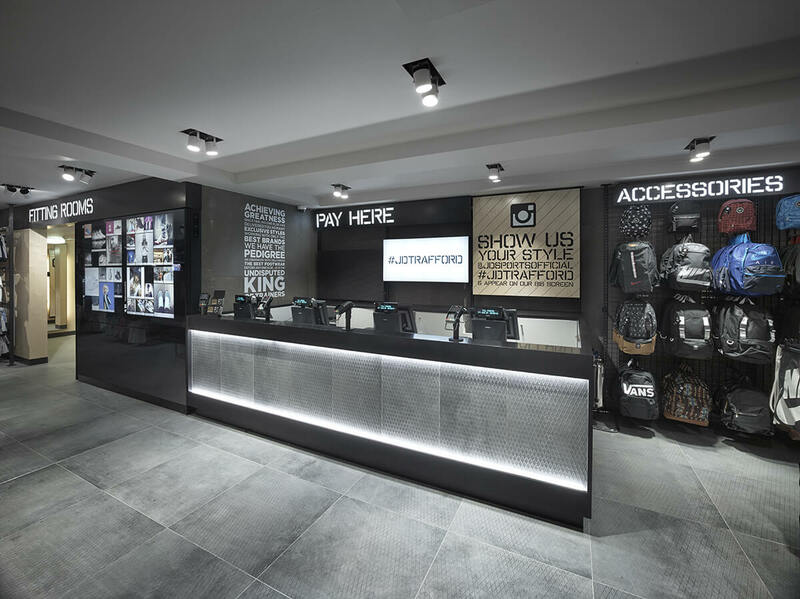 The current format consists of a double unit space with an existing mezzanine area and an adjacent standalone store with access to the main unit. 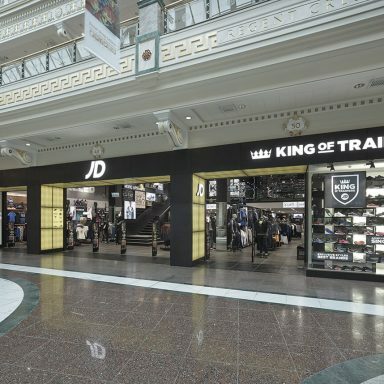 The combined space houses JD Sports, King of Trainers and a standalone adidas store. 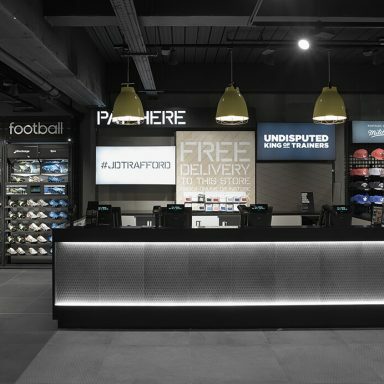 The refit took 14 weeks to complete and during this time a temporary JD Sports store was opened in a small unit about a minute’s walk away. It was proposed to merge the neighbouring units to create a single enlarged unit and provide a larger slimmer mezzanine floor with improved head heights incorporating mechanical and electrical services. 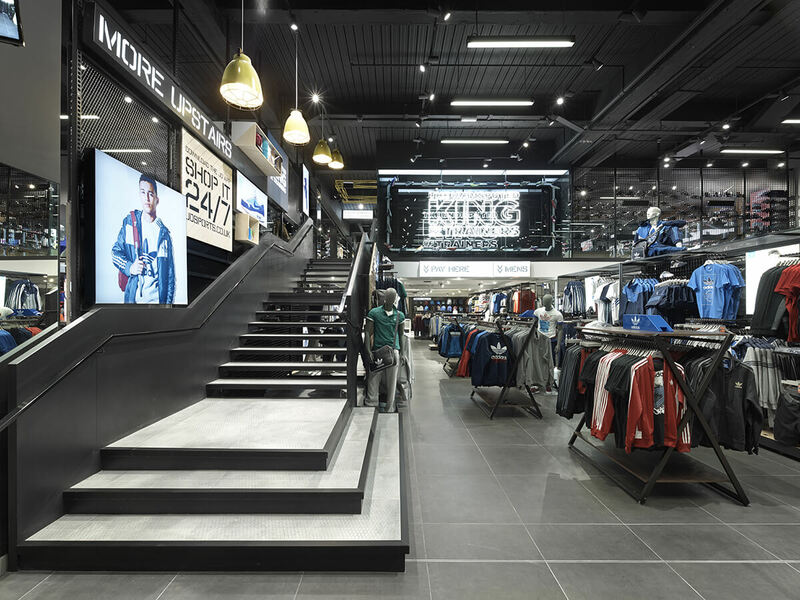 The new space includes a bespoke staircase and passenger lift to the mezzanine floor and provides optimum retail opportunity. Re-fitting a large space between key trading dates proved a challenge. 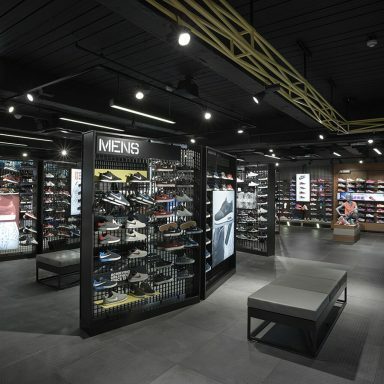 The enlarged space including mezzanine and retail floor space presented difficulties from a fire regulation point of view for the designers. Due to the land locked nature of the unit this meant that smoke extraction was not feasible. Fire regulations required a complete structural separation from the retail area to the back of house areas. This required careful coordination between all the parties involved. Due to the nature of the ground, coupled with Trafford Centre requirements, mezzanines are required to be of lightweight construction and take support from existing columns. 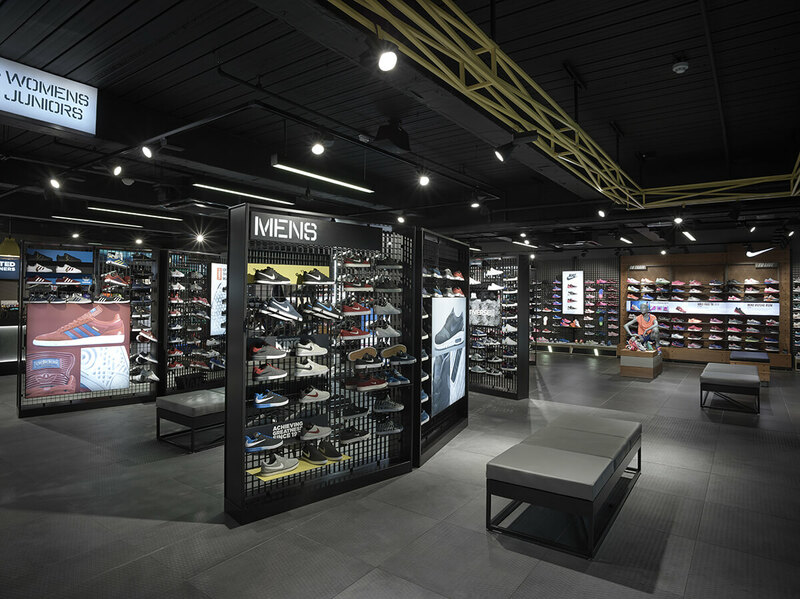 The JD flagship concept design for mezzanine floors included large ceramic tiles which was not advisable due to flex in the floor. Our team worked closely with the floor tile manufactures and the main contractor, to develop a lightweight mezzanine solution that allowed ceramic tiles to be provided without cracking. 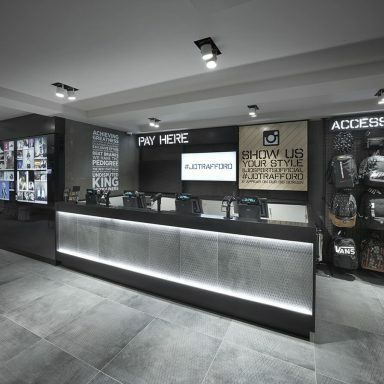 Whilst our team work within tight timescales and to strict budgets, the quality of the end product is never compromised from a retail perspective and from the customer’s point of view. The revamped space now boasts a ground floor and mezzanine. 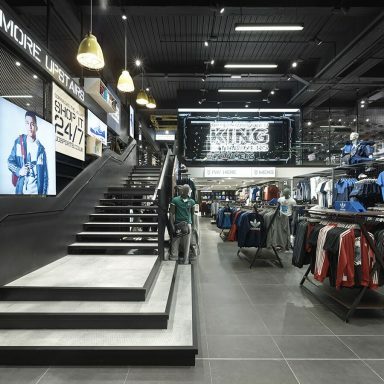 Our team worked closely with the designer to develop the store concept, equipment and the sleek and wide-spanning open-tread staircase to deliver a fantastic trading and retail experience.